86+ aren't stupendously low to be fair, they've held their value since yesterday probably due to Hulk and Socrates. If you're looking for a 100% risk free investment, go for the 80-82 IFs from this TOTW for under 10-12k, and also 83 rated players are discard price at 750 coins. You can't lose there. The 84s and 85s are also at an all-time low, not quite risk-free but excellent investments nonetheless. These easy sbc packs, 2for1 packs, easy get coins means that market and players have tons of these cards. And players usually sell their investments at the same time. When really good sbc comes then some cards will go up but generally not worth for big investments. Ya, history proves if you're patient you'll always make coins if you buy at the right price. There's still some big SBCs to come with this promo, plenty of room for higher rateds and 83/84s to rise. Just a heads up, the 83 rated squad SBC in Prime Desailly offers a mega pack for around 11-12k, at worst you'll probably break even thanks to discards, definitely worth doing at current prices! Is there any reason why Scott Sinclair is extinct on the PS4? Was just checking my club and it seems he just rocketed to 50k? Is this because of Carniball Weah? When are we expecting Bundesliga POTM to drop? Man.. wondering when my 85 rated IFs will rise.. They'll be too expensive I'd have thought. Those people who will complete the mega icons have been saving their IFs and high rated untradeables all year for these guys, the casuals won't want to get them so it's questionable whether the market will shift. For your investments to pay off, you really just need EA to drop the 'right' SBC that the playerbase is all happy to do. 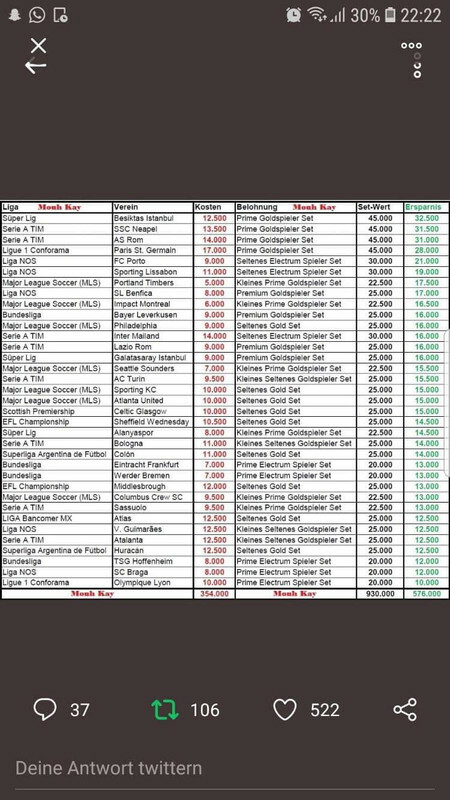 A base icon SBC is your best hope, that's when prices were at an all time high for 83-86s. Repeatable high-end SBCs are usually the best for cleaning the market of high rated cards. If nothing good comes during FUT Birthday, then you'll just need to hope for a spontaneous insane flashback or random SBC card that everyone wants to do (Ibra for example), otherwise it'll probably be at least until TOTS! Should I sell my 81/82 rated IF’s now or wait till FUT Birthday? Amount of 76-82 card is phenomenal If theres coming IF SBC. So, you put 30-40 k to sbc 5 times and best pull is some Macedonian 82. Sell half now, keep half. Looks like it's gonna be another big promo for FUT Birthday. Probably the last investment potential until TOTS (at which point trading is almost useless), may as well offer my two cents worth. With 10 prime icon moment SBCs on the way - looking at the ones they might put up - I reckon we might finally see some of the big boys (if not, some very good ones like Best, at the very least). If that happens, we'll get some massive requirements with either icons (unlikely based on EA's patterns so far), or some huge 88-90 rated squads. Even during promos, the 89-90 rated cards seem to spike in price by 5-10k when big SBCs are offered, I'd actually recommend grabbing as many as you can before the event. In spite of all the packs that'll be opened tomorrow I still reckon they'll rise. Be ready to grab a handful of 83-84s tomorrow too. At the moment I feel as though they've been over-invested into, so I'd probably wait and hope they drop a bit first (84s specifically are at 3.5k+ already). Hopefully we get lightning rounds and nothing too big comes up SBC-wise, it'll be a great time to stock up. It's been ages since TOTW SBCs and EA confirmed we'd get upgrade SBCs of some sorts - add that to the 11 FUT Birthday related player SBCs, and there's big scope for profit I reckon. ^ all good advice for sure. Buying up 88-90s during the (hopefully) madness tonight is my plan at least. Last promo I’ve bought a few godin 90 for 55k the day before the promo just to see that during lightning rounds he went down to 48k, not making the same mistake again! Also think sniping relevant players for the weekly objectives at 6pm could be a gold mine. Very short window on that though. Just be patient for your 83s/84s. We've got a good 16 SBCs still on the way, and normally the promo packs EA offers up tends to worsen as the days go on. We've had mass 50k/100k/125k packs so far, expect them to slow down now. Eventually there'll have to be a couple of really desirable and affordable SBCs that shift the market. We haven't even got the upgrade SBCs that EA have promised, so if there's a TOTW/Icon upgrade then that'll be the time the market goes berserk. Bought 22 Insignes for 28-30000 over Thursday to Friday, tonight they briefly spiked to closed to 60k. I'm not sure why, but I assume a futbin solution? Managed to offload 14 for 58k during that period. A juicy 352k profit. 8 more to sell if they drop another decent SBC. Best bit of profit in a while for me (stopped actively trading after TOTY). IF Zuber going for 30k atm! Don’t know if someone invested in him?